Lalji Patel is the convener of the Sardar Patel Group (SPG) which had launched the Patidar quota agitation along with Hardik Patel-led Patidar Anamat Andolan Samiti. AHMEDABAD: Lending support to Gujarat Deputy Chief Minister Nitin Patel, who is miffed over the portfolios allotted to him in the new BJP government, Patidar leader Lalji Patel today called for a Mehsana `bandh' (general strike) on January 1. He also threatened to call for a state-wide bandh if Nitin Patel was not made the Chief Minister of Gujarat. Lalji Patel, who is the convener of the Sardar Patel Group (SPG) which had launched the Patidar quota agitation along with Hardik Patel-led Patidar Anamat Andolan Samiti, today called on the deputy chief minister at his official residence in Gandhinagar with dozens of supporters. "The BJP is repeatedly doing injustice to Nitin-bhai Patel. Today I met him with supporters from Mehsana, and we have given a call for Mehsana bandh on January 1 in his support," Lalji Patel told reporters. Nitin Patel is MLA from Mehsana, which has a sizable Patidar population and which was the epicentre of the quota agitation. 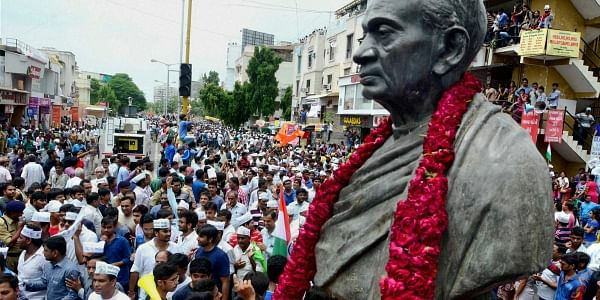 "People of Gujarat and former chief minister Anandiben Patel wanted Nitin Patel to be made the chief minister (when Anandiben resigned). He was not made the CM but he accepted the decision and decided to work as deputy chief minister. People are angry with the latest development. Nitin-bhai is the right candidate for chief minister's post," he said. "We met Nitin-bhai...We asked him what is needed to be done. It is now for him to take the final call. He said the party's high command has said it will decide the matter in two days," the SPG leader said. Ketan Patel, another Patidar leader who left the PAAS to join the BJP, also met the deputy chief minister. "Nitin Patel has worked tirelessly to mollify the agitated Patidar community and played important role in bringing the party back to power. The BJP high command should address his concerns positively," he said, adding that the BJP should ensure that political opponents do not take advantage of the development. Earlier in the day, PAAS leader Hardik Patel declared support for Nitin Patel and said the BJP sidelined him despite his hard work. In the previous government Nitin Patel handled portfolios such as finance and urban development, while in the new government, which was sworn in earlier this week, he was given relatively lightweight departments such as road and building and health.